The TRIAC is the three terminal semiconductor device and used for controlling the current. From the name of the TRIAC, the word Triode is for alternating current and it is effectively developed with the help of the SCR or Thyristor. But the Thyristors are able to conduct the device in one direction and the TRIAC is bidirectional. The Triode For Alternating Currents are able to switch high voltage and high level of current and on both the parts of AC waveforms. This device is used widely in AC power control applications. The TRIAC is an ideal device used for the AC switching applications. This can control the flow of current over both halves of an alternating cycle. 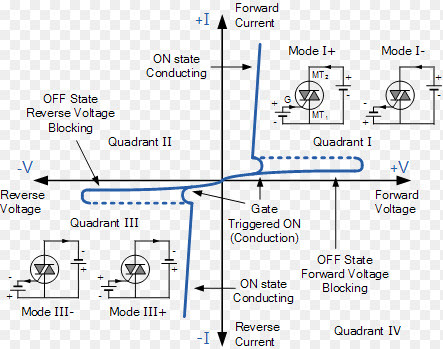 Only the Thyristor can control over the one-half of a cycle. The other remaining half no conduction occurs and accordingly only half the waveform can be utilized. The symbol consists of three terminals which are Gate, Anode or Main terminal. The two terminals are labeled as an anode1, or anode2, main terminal MT1 or MT2. From the outside view, the symbol is viewed as a back to back Thyristors which we can observe in the symbol. The TRIAC consist of four layers like PNPN is in the positive direction and the negative direction consists of NPNP as we can see in the figure. The three-terminal bidirectional device blocks the current in the OFF state and it will act as an open circuit switch. But for the distinct conventional thyristor, this device can conduct the current in both directions when it is triggered by a single gate pulse. The TRIAC operations as four triggering modes of operations and the following are the possibilities. The four triggering modes of operations can operate by using the I-V characteristics of TRIAC. 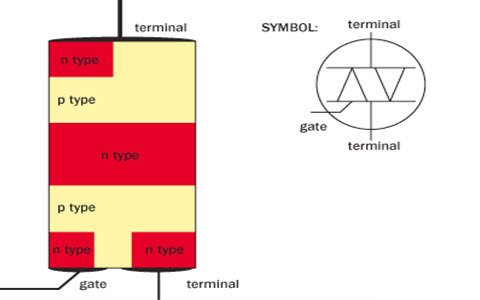 Where VMT21 and VGl are the voltages of the terminal of MT2 and gate with respect to terminal MT1. The following figure shows the typical TRIAC characteristics. The Triode For Alternating Current consists of ON and OFF state characteristics which are similar to the SCR. Now the characteristics are applicable to both the voltages of positive and negative. This we can predictably because the Triode For Alternating Current consists of two SCRs which are connected in parallel and they are in opposite directions. In the first quadrant the MT2 is positive with respect to the MTX and in the fourth quadrant, it is in the negative. The gate trigger may occur in any four quadrant modes of operation. If the device is in ON state the conduction permits a huge amount of current to flow through it. A large amount of current is controlled by the resistance, otherwise, the device may be damaged. With the device, the gate is a control terminal and the proper signal is applied to the gate, therefore the firing angle of the device is controlled. The circuit which we have used in the gate for triggering the device is called the gate triggering circuit. For the TRIAC the gate triggering circuits are similar to the SCRs. Generally, the triggering circuits will generate the triggering pulses for firing the devices. The triggering pulses will have sufficient magnitude and duration, hence the firing of the device is assured. To sustain the firing of the device duration of 35 us is required. 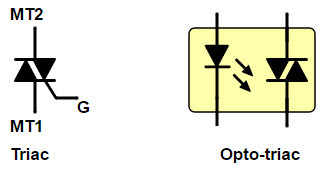 The TRIAC is a semiconductor switch and the switch is turned ON by using the triggering pin. 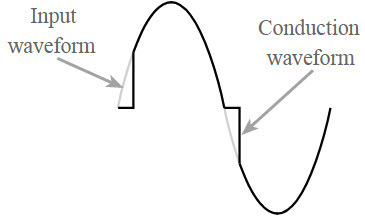 Once the semiconductor switch is turned ON, then the current drops lower than the hold-on value. By delaying the turn-on point for some time after the voltage crosses zero volts – the zero-cross point – the voltage can be adjusted although it is no longer sinusoidal. 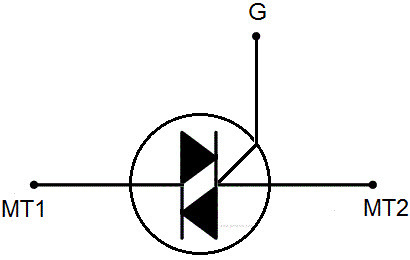 The following figure is used to give the variable phase angle control to the above figure. Sometimes they are also known as a random Opto-TRIACs or SSRs. The following circuit shows the switching circuit of TRIAC. 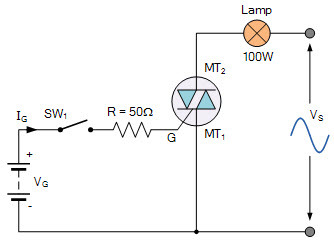 The operation of this circuit is if the switch one is open then the device act as an open switch and the lamp passes through the zero current. If the SW1 is closed the device is in ON state with the help of the current limiting resistor R. The self-latches shortly after the start of each half cycle, therefore the switching power is full to the lamp load. The input supply of this circuit is sinusoidal AC then the TRIAC automatically unlatches at the end of each half cycle. The instantaneous power supply voltage and the load current falls to zero and it will re-latch it again by using the opposite thyristor half on the next half cycle as long as the switch remains closed. Generally, this switch is called as a full wave control because the both halves of the sine waves are being controlled. In the TRIACs, there will be single gate control conduction in both the directions. Basically, it is bidirectional device and in the both the directions it will conduct. It has very high switching delay. By reading this article you have gained some basic information on the construction of TRIAC. If you have any queries about this article or about the implementation of Electrical and electronic projects for engineering students, please feel free to comment in the below section. Here is the question for you, what are the functions of the TRIAC (Triode For Alternating Current)? we are leading importers of lights .